Still working on flowers for the craft fair. I'm really, really enjoying knitting them. They are addictive. 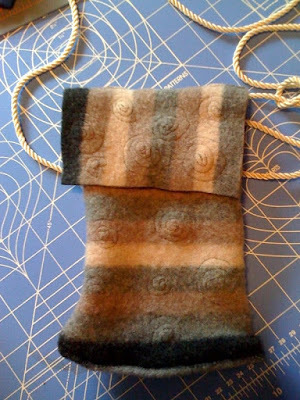 This flower, attached to a little felted bag, is knit with handpainted sock yarn. I needle felted the swirly. I knit this bag a few years ago when I was going through my drawstring bag phase, and added the flower last night. 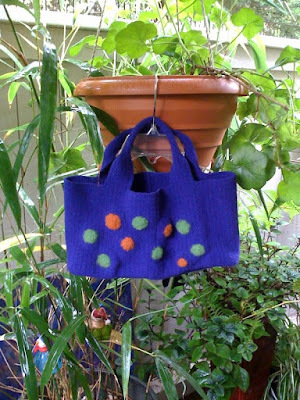 My sister, the talented Ms. Feltypants, will be selling these felted totes she makes from recycled wool sweaters. 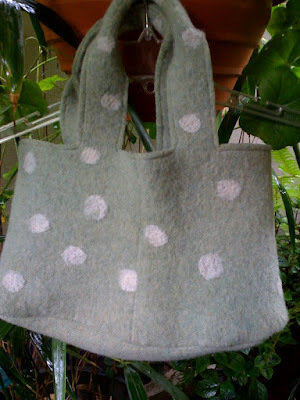 She needle felted the polka dots. I love this one and might need to buy it for myself. You're knitting up a storm. Your sister does some nice work, too. What a great team! and your talented sisters are AMAZING!!!!! too. I LOVE them. And all these flowers you are turning out are the PRETTIEST THINGS EVER!!!! My Goodness You've got me so excited and exclaimy here. I really do Love what I have seen here. I feel very much inspired to go make some more flowers and try out some felty things too. The knit flowers are so sweet.